Hawaii Sen. Daniel Akaka, third from right, with (l. to r.) IR Dave Bunch; Dir. of Political Affairs Bridget Martin; Gary Aycock, L-627; Keola Martin, L-90; and IVP Warren Fairley. 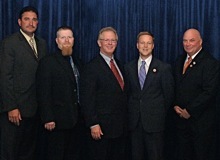 Rep. Jason Altmire (D-4th PA), standing fourth from right; with IP Newton Jones, standing fifth from right; IVP Sean Murphy, seated second from left; and delegates from Locals 154 and 374. Rep. Joe Donnelly (D-2nd IN), third from right, with (l. to r.) Glenda Pell, L-374; Scott Kirby, L-374; IR Charlie Brock; Tim Aschcraft, L-M300; Bill Coleman, L-1620; IP Newton Jones; Eric Estes, L-374; Steve Mantz, L-374; and IVP Larry McManamon. Rep. Joe Donnelly (D-2nd IN), fourth from right, with (l.-r.) Rita Bennett, L-M300; guest Julie Ewell; Douglas Ewell, L-374 (behind Julie); Tom Gammons, L-374; Rob Mattox, L-M300; Greg Hay, L-374; IP Newton Jones; Preston Miracle, L-1240; Rob Haney, L-1240; and IVP Larry McManamon. Rep. Bob Filner (D-51st CA), fifth from right (back), with, IP Newton Jones, sixth from left; IR Dave Bunch, third from left; and delegates from Locals 549 and 1998. Rep. Dale Kildee (D-5th MI), center, with L-169 delegates, l. to r., Donald Fajardo, Jim Calouette, Mike Card, Bob Hutsell, Chanol Wilkie-Jones, and Grant Lynch. Rep. Carolyn Kilpatrick (D-13th MI) with members of Local 169, l. to r., Donald Fajardo, Mike Card, Chanol Wilkie-Jones, Bob Hutsell, and Grant Lynch. Rep. Ben Luján Jr. (D-3rd NM), fourth from right, with, l. to r., Gary Aycock, L-627; Curtis Martin, L-627; Russell Crossan, L-627; IP Newton Jones; guest Laverne Barber; Lester Begay, L-4; and Jim Welck, L-627. Rep. Patrick Murphy (D-8th PA), third from right, with IP Newton Jones, center, and L-19 delegates, l. to r., Fred Chamberlain, Mocus Braswell, Dave Gaillard, and at far right, Charles Bruno. Second from right is Gary Gaydosh, president of the Philadelphia Metal Trades Council. Rep. Tim Murphy (R-18th PA), standing fourth from right, with IP Newton Jones, standing fifth from right; IVP Sean Murphy, seated second from left; and delegates from Locals 154 and 374. Rep. Glenn Nye (D-2nd VA), third from right, with delegates from Locals 45 and 684. Rep. Donald Payne (D-10th NJ) third from right, with, l. to r., Jay Brophy, L-28; Ed Latacz, L-28; IP Newton Jones; John Devlin, L-28; and Dir. of Political Affairs Bridget Martin. Rep. Laura Richardson (D-37th CA), third from right, with, l. to r., guest Juanita Ellis; Wilmer Ellis, L-549; Mark Sloan, L-549; guest Tiffany Sloan; Diana Barrientos, L-1998; IP Newton Jones; guest Anna Maria Godinez; and IR Bobby Godinez. Rep. Aaron Schock (R-18th IL), standing sixth from right, with IP Newton Jones, standing fifth from right; IVP Larry McManamon, seated second from right; Intl. staff members; and delegates from Locals S8, 60, 363, 482, 483, and 1600. Rep. Paul Tonko (D-21st NY), center, with IP Newton Jones, third from left; IVP Sean Murphy, at left; and L-5 delegates, l. to r., Tom Klein, Tom Cook, Jerry Connolly, and Kevin O’Brien. Relationship-building is an ongoing process for good reason. The life of a member of Congress is frenzied, and constituents from many walks of life compete for their time and attention. Boilermakers who are active politically do their best to stay in touch with legislators, whether the elected representatives are in their state offices, in their U.S. House or Senate offices, or in non-official settings like the reception. Congressional aides are an important link to legislators. Aides keep current with the many issues and bills being considered and advise members of Congress on constituent interests. “Face time” with legislators and aides — even if it’s only five or 10 minutes — helps delegates get to know them much more effectively than does, say, a phone call, letter, or e-mail. The Boilermakers’ annual congressional reception also helps legislators, government officials, and officials from other unions learn more about who we are, and what is important to our members and their families. Making friends on Capitol Hill is essential to keeping our issues in front of those who make the laws.